Each of the state’s 17 educational service units would hire a social worker to aid students with behavioral or mental health problems under a bill heard by the Education Committee Feb. 12. LB998, introduced by Fremont Sen. Lynne Walz, would create a collaborative school behavioral and mental health program with the goal of providing each ESU with a social worker to train teachers and other school personnel and to work with parents, schools, behavioral and mental health care providers and other resources to provide services to students. Walz said the bill’s primary goal is to prevent violent incidents at schools by helping students who have mental and behavioral health problems. 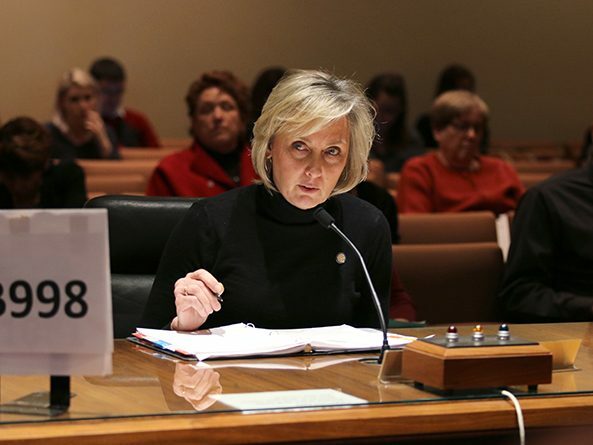 LB998 would provide services to address those problems, she said, and it would track resources in communities across the state, giving the Legislature more information on where additional support might be needed. The program would be a collaboration between the ESU Coordinating Council, the ESUs and the school districts within each ESU. Social workers hired under the program could use screening and assessment tools to identify students in need of services and assist in matching students with appropriate health care providers. The ESU Coordinating Council would solicit annual program plans from each ESU, identify evidence-based best practices in interventions for students, coordinate training for social workers and other school personnel and complete annual evaluations of each program. It also would create and maintain a statewide map of behavioral and mental health services. Walz said the program would cost approximately $1.2 million per year, and she has found private donors to fund it for the first three years. After that, each ESU would determine the program’s cost in its service area. If the ESU decides to continue, the program’s cost would be shared by the ESU, school districts within the ESU, state general funds and private donations. The program would end if its costs exceed the ESU’s available funds. David Ludwig, executive director of the ESU Coordinating Council, testified in support of the bill. He said the program would help ESUs and school districts identify gaps or overlaps in behavioral and mental health services to ensure that all Nebraska students have equitable access to those services. “Right now, we don’t have the capacity to do that because we don’t have social workers within every ESU,” Ludwig said. Also testifying in support was Debra Anderson Pappas, senior director of early intervention and training at Project Harmony, a child advocacy center in Omaha. 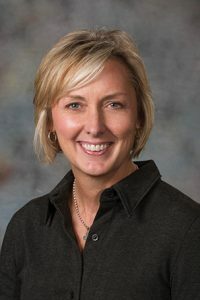 She said Project Harmony’s Connections program, which identifies children in need of mental health services and matches them with appropriate services, has helped 3,000 students in the Bellevue, Millard, Omaha and Papillion school districts since it began in 2015. Laura Barrett, special services director for ESU 13 in Scottsbluff, also testified in support. She said ESU 13 currently provides school psychologists and a mental health practitioner to students, but a social worker would help connect more families with mental health resources. School personnel often cannot refer students to mental health services simply because they are not aware of what resources are available, Barrett said, and most do not have the time and resources needed to apply for mental and behavioral health grant programs. Mike Waters, Crete Public Schools superintendent, also testified in support of the bill. He said Crete, Norris School District and Wilber-Claytonia Public Schools have hired a school psychiatrist who spends up to two days per week at each school to provide intensive services to students with severe mental health problems. The psychiatrist serves 19 students at Crete—with at least 10 more on a waiting list—and each student can wait up to three weeks for a one-on-one visit, Waters said. “There’s such a need that it’s actually above and beyond what one person can handle,” he said.